Big news for Batman fans: Jared Leto's look as the Joker in Suicide Squad has officially been revealed, and it is... well, different. Leto will play the grinning villain in the upcoming Suicide Squad movies, and will be the first actor to depict the Joker since Heath Ledger in The Dark Knight. Other actors who will appear in the film include Will Smith, Margot Robbie, Cara Delevingne, and Viola Davis — among many others. Obviously, Leto has incredibly big shoes to fill following Ledger, and Leto has to manage the balancing act of paying tribute to his predecessor and making the role his own. Considering how many comic book fans felt a connection to Ledger's portrayal, it's not an easy task. 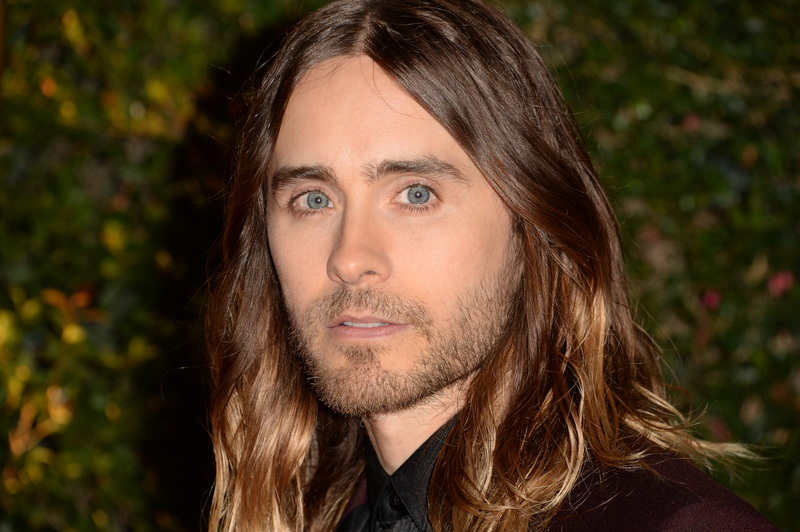 Suicide Squad director David Ayer revealed Leto in full costume in a tweet on Friday. Leto's new look as the Joker is about as different from the Joker of the Dark Knight as is possible to get: Leto's Joker has (short) green hair, is covered in tattoos, has graying/metallic teeth, and he is (most significantly) not grinning — in fact, I'd call it more of a snarl. Instead, the traditional grin is now tattooed on his forearm. I have a few questions about this image. First, will Leto have his shirt off all the time? Second, has the snarl replaced the grin? Many fans of the comics are a little worried that the costume verges on parody or is straying a little far from the canon, and perhaps Leto's portrayal might be a little less than classical. He looks roguish in this, like a biker Joker, or something, so it wouldn't be a far stretch to wonder if his behavior will match. However, true DC fans have managed to find some canonical basis for the new Joker costume — this especially becomes apparent when you look at Frank Miller's depiction of the Joker from All-Star Batman & Robin. Additionally, his many tattoos are classic Joker references, from the cards to the laughter all across his chest. Whether Leto will be a different Joker to the one we're used to in Batman adaptations seems unclear at this point, and, as the film doesn't come out until next summer, comic book fans have plenty of time to speculate.